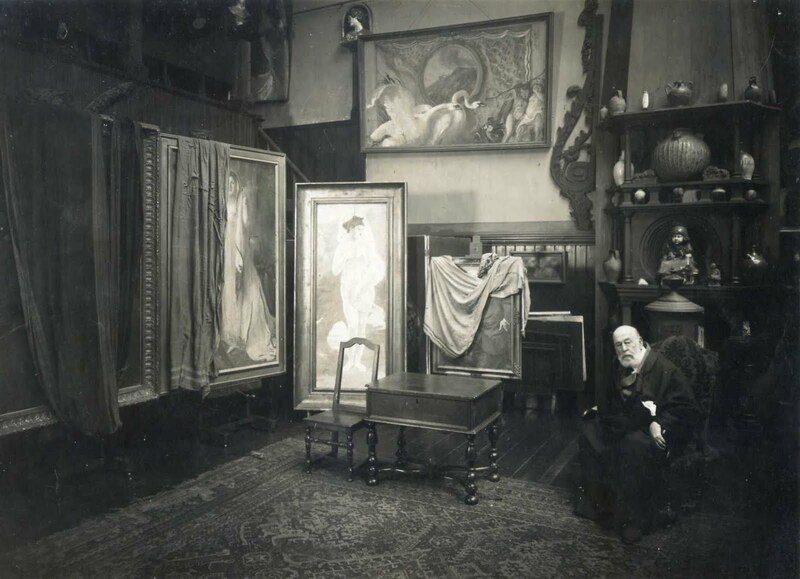 Arnaud de Coninck considers the work of the late 19th-early 20th century Parisian artist Albert Besnard (1849-1934), from the point of view of his idiosyncratic frame designs. 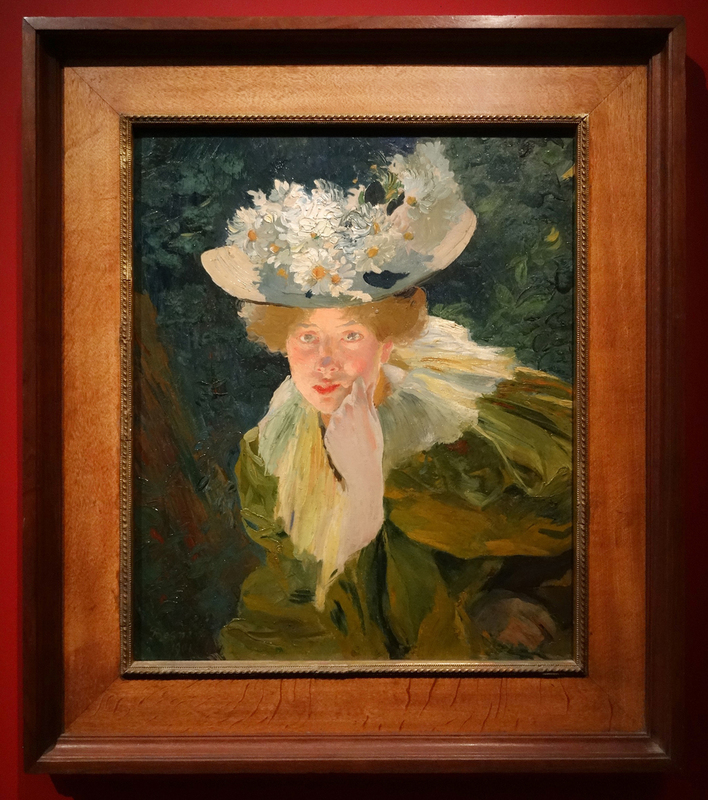 Albert Besnard: Modernités Belle Epoque was a temporary exhibition which took place at the Petit Palais, Paris, from October 2016 to late January 2017. The exhibition aimed to highlight an important but forgotten French artist who lived from 1849 to 1934. Besnard was in fact the first painter to receive a state funeral from the French Republic, a reflection of his impressive artistic production. 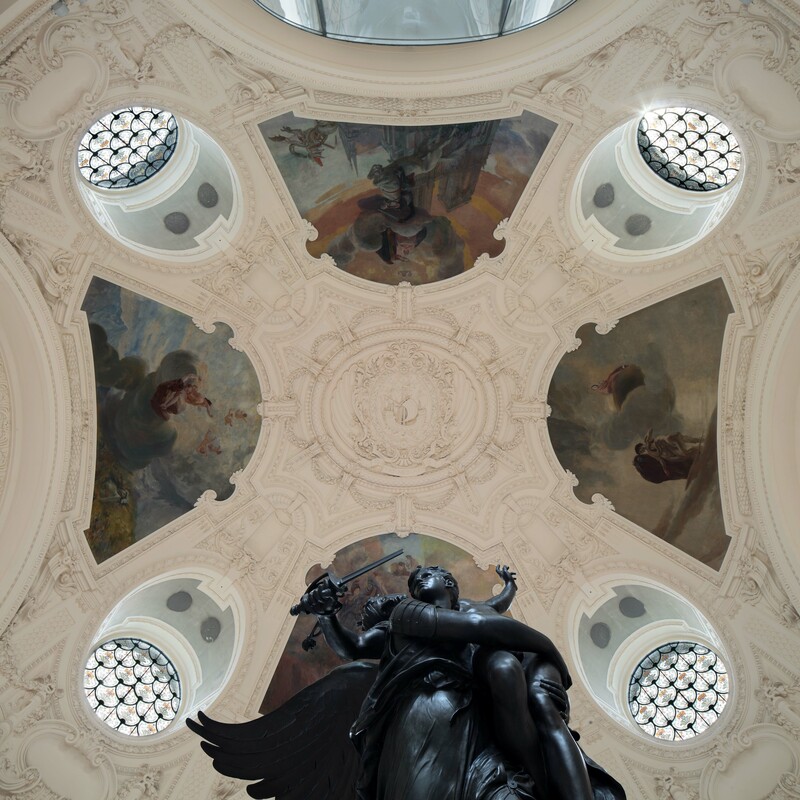 I must confess that, both as a Frenchman and as a former art history student, I didn’t know much about him before visiting this retrospective – except perhaps for the decorations he painted in the dome of the Petit Palais itself. Neither did I know much of, nor pay particularly close attention to, frames. 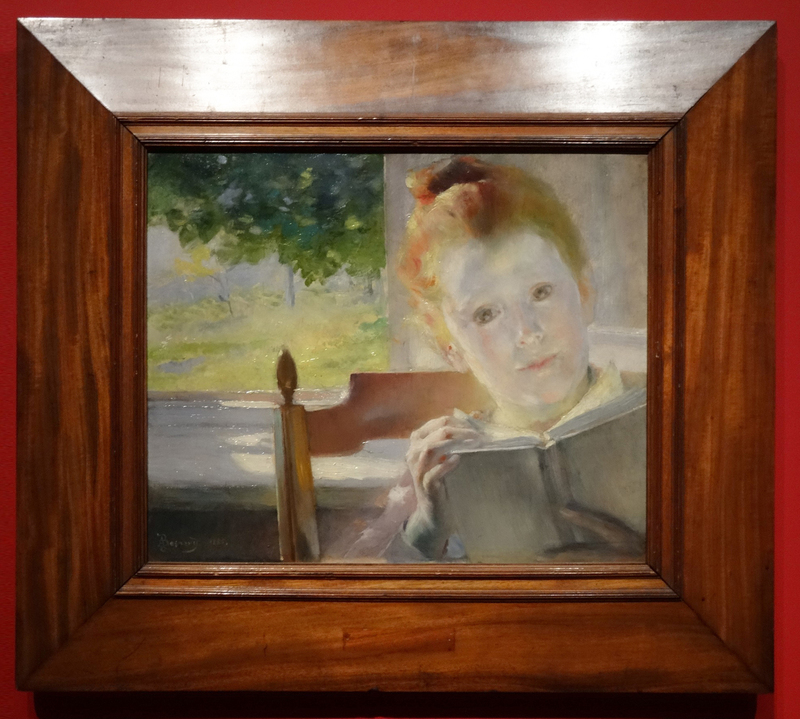 In fact, not only has this exhibition been a brilliant opportunity to rediscover a great artist through some 200 artworks, but it has also been a chance to admire a wide variety of interesting frames. As I am not an expert, what follows are only a few first impressions and thoughts. Let’s start a frame focused tour! Before entering the exhibition proper, one could see some paintings and engravings by Besnard displayed in an introductory room. Amongst them, one frame immediately caught my eyes: Femme à la fenêtre or Woman at the window. It features a woman portrayed from behind, leaning on a balcony and staring at an outside garden. 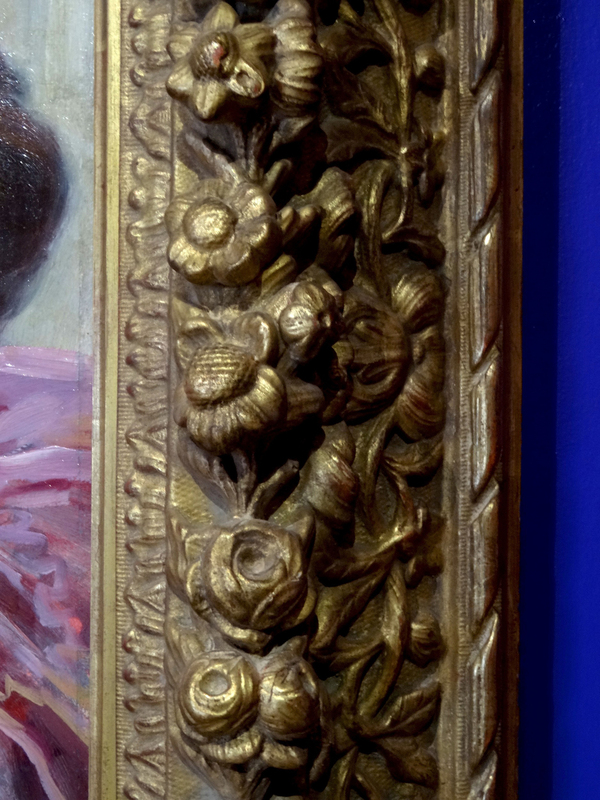 What I noticed is that the frame suits this subject, as it is composed of different sculpted flowers, vegetal interlacing, leaves and other plants. 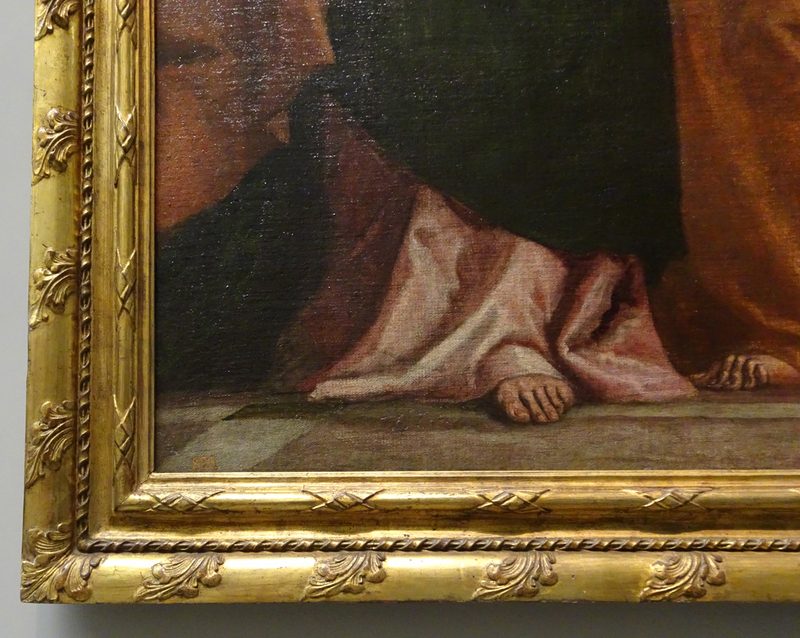 Somehow, its surprising depth makes it look more like a window frame than the frame of the painting. This puts us in the situation of a person looking through a window, rather than a painting, in a sort of subtle mise en abyme. This way of enhancing the illusion of depth and increasing the perspective was certainly not new, even in Besnard’s lifetime, but is still effective and nice to observe. 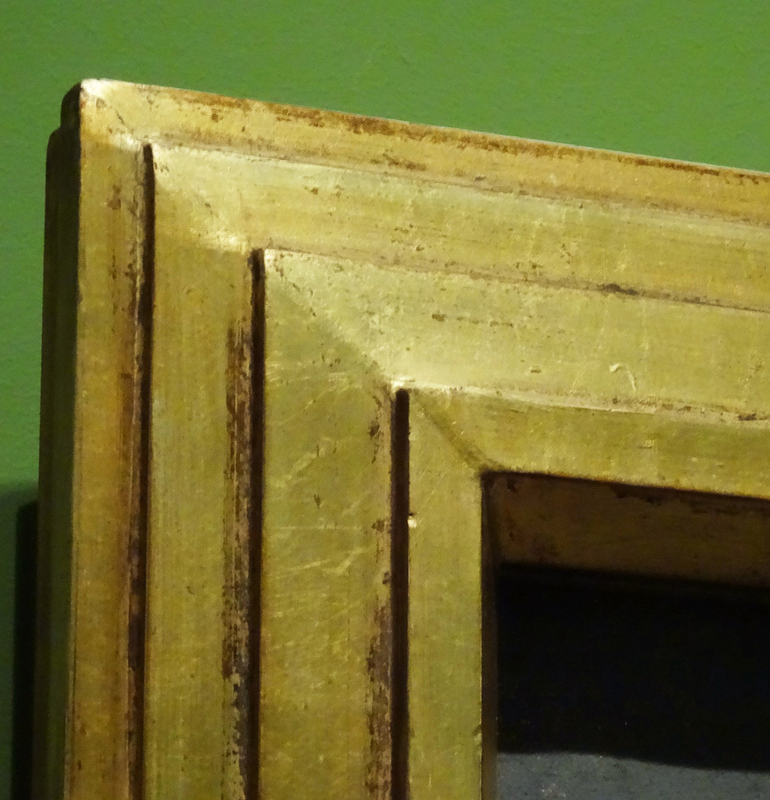 It is evident that an old frame is being re-used here, since the painting has been fitted to this setting with the help of a plain gold slip, or inlay; this probably means that the artist was not responsible for this combination. 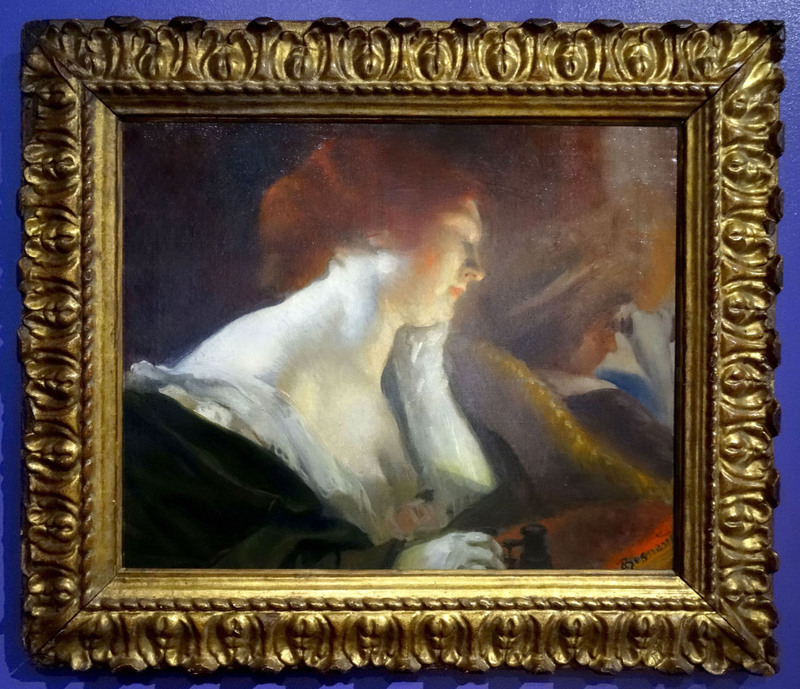 However, it does tell us a lot about the expectation of the contemporary dealer or collector – that a painting by Besnard should not be displayed in a run-of-the-mill moulding: that it should have as much care and thought applied to its setting as the exhibition reveals that he himself gave. On either side of this painting were several others with strikingly different frames, which were evidently Besnard’s own choices. One which seemed quite plain in comparison with Femme à la fenêtre, for example, was L’enivrement des roses: not an elaborately decorated gilded frame, but instead relatively simply carved in a warm, polished wood. 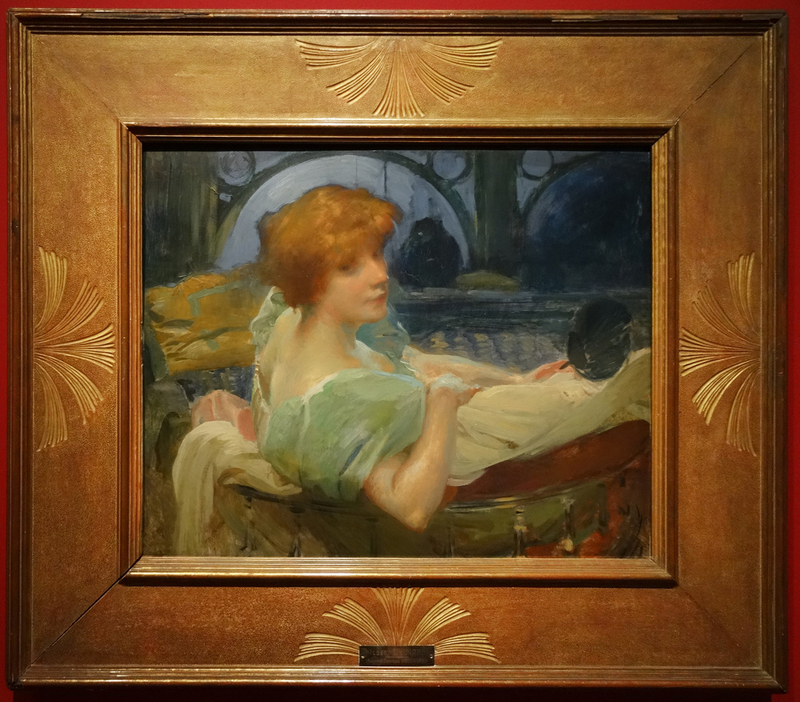 There are other examples of Besnard’s work in similar polished frames – for example, Le chapeau de paille and Matinée d’été (above, from the exhibition), as well as Femme pensive aux bras levés (1889, collection Lucile Audouy) and Nu dans l’atelier (c.1900) – which have different profiles, but use the same border of gleaming wood as a foil to close-up portraits against a background of foliage. These are a reimagining and updating of the 17th century cabinetmaker’s frame, and even now seem strikingly modern for their time. 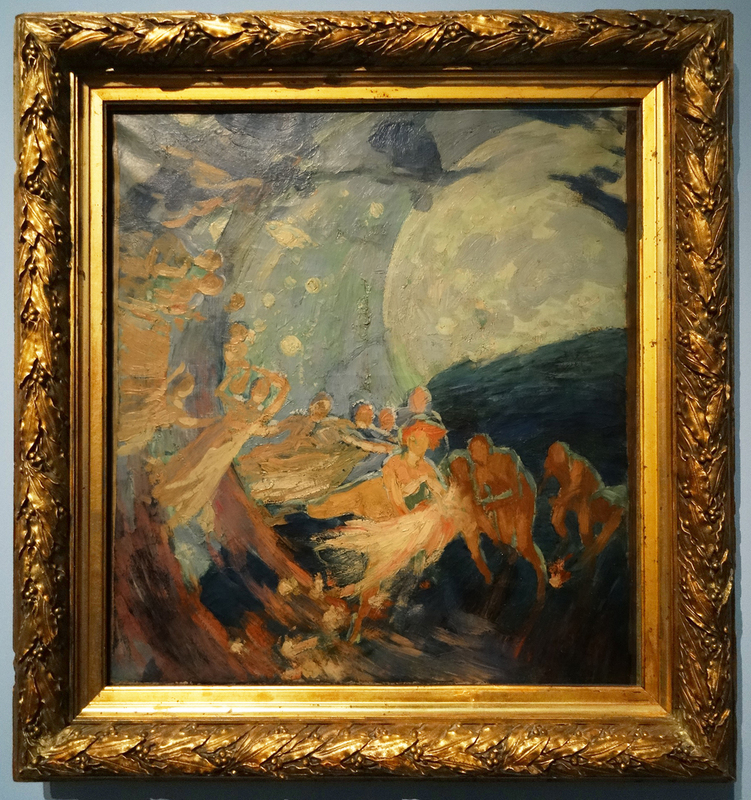 They also seem slightly in advance of polished wooden frames as used by Post-Impressionist painters such as Paul Sérusier (Eve Bretonne, 1890), or Henri Edmond Cross (L’air du soir, c.1893-4). 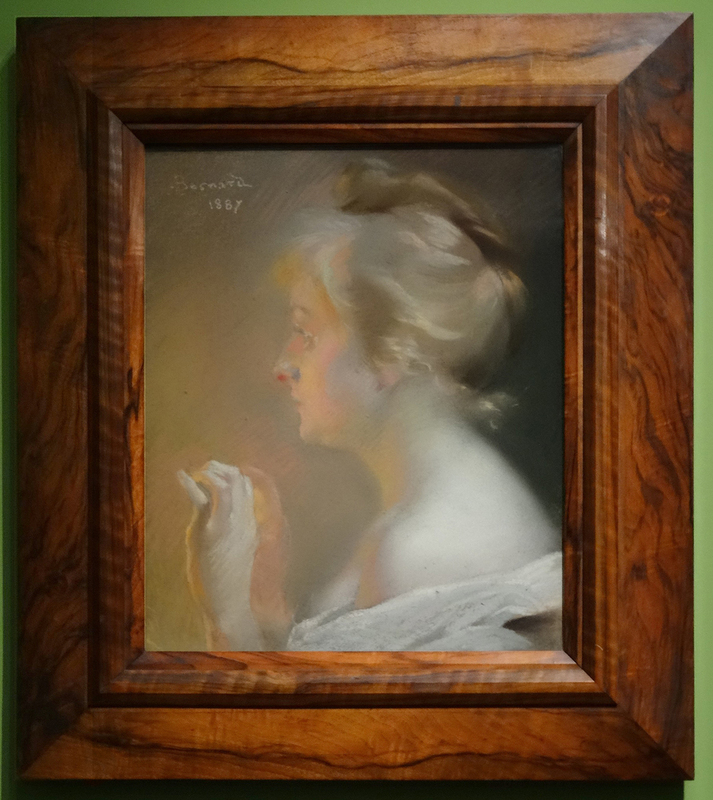 Another example on display was the frame of Devant le feu or La frileuse, from a section with pastel paintings of women, which was further on in the exhibition. As with Femme à la fenêtre, this frame harmonizes particularly well with the work it contains. The drawing depicts a woman sensitive to the cold trying to warm herself in front of a fire. 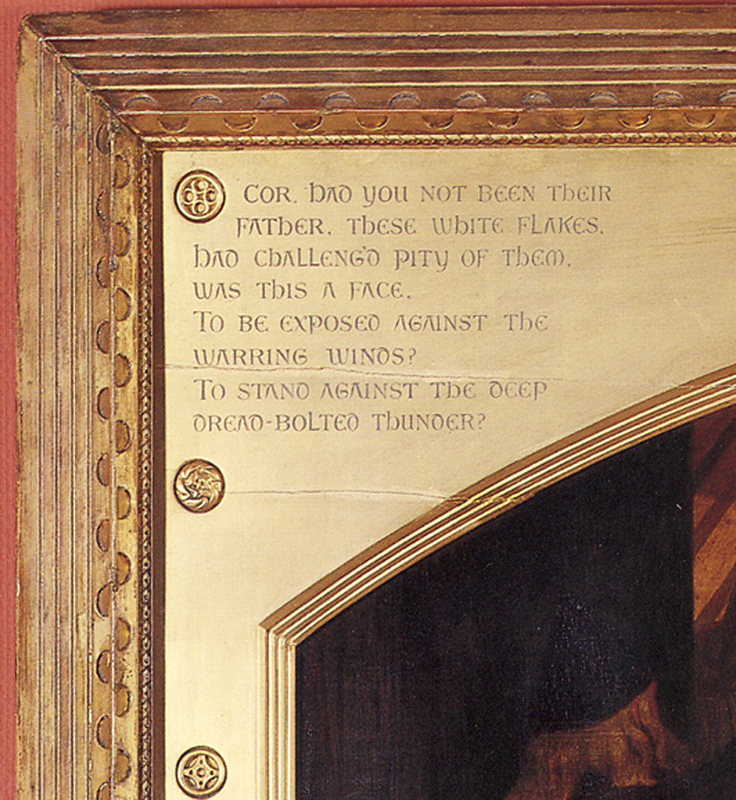 The glow of the flames extends into the wood of the frame, which is a deep brown or reddish colour, maybe acacia. Its grain seems blends into the flames or perhaps to represent the smoke coming from the fire. Both the tone of the wood and its grained polished sides bring the fire to life in a vivid way. 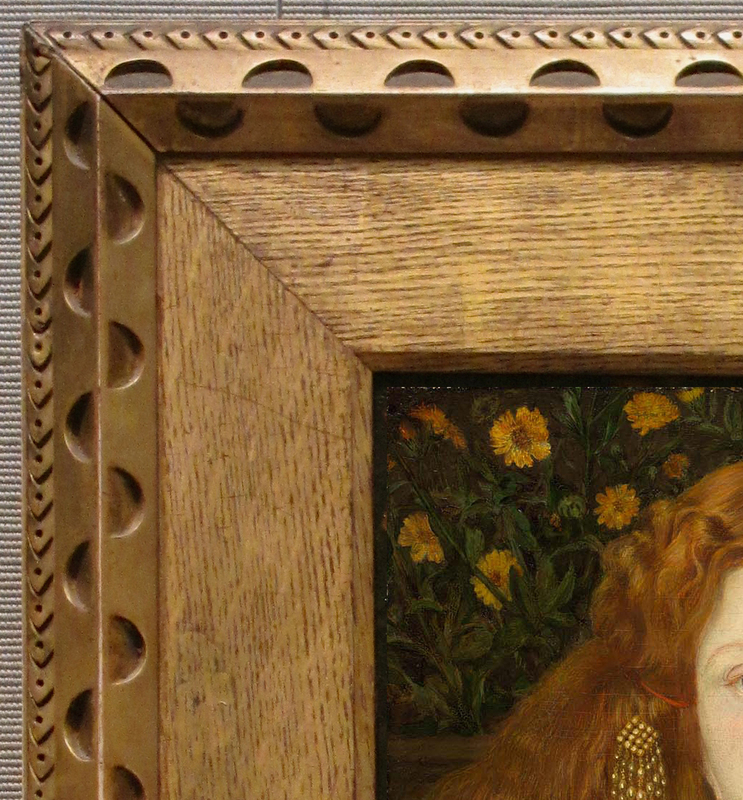 This frame has a bolection profile with a deeply canted section, like the frame of Matinée d’été; it is a particularly effect way to display a small figure painting of this type, and has something in common with the Pre-Raphaelite D. G. Rossetti’s small bust-length paintings of women set in mouldings with a triangular section. 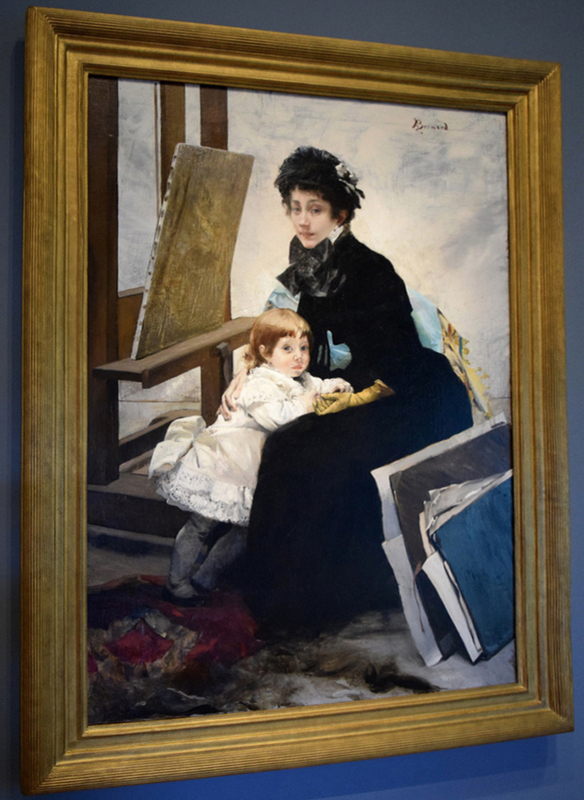 There are also much more conventional frames in the exhibition, however – for example, a contemporary moulded revival of a ‘Salvator Rosa’ style frame on a group portrait of Besnard’s own family, with the artist’s self-portrait in the background. 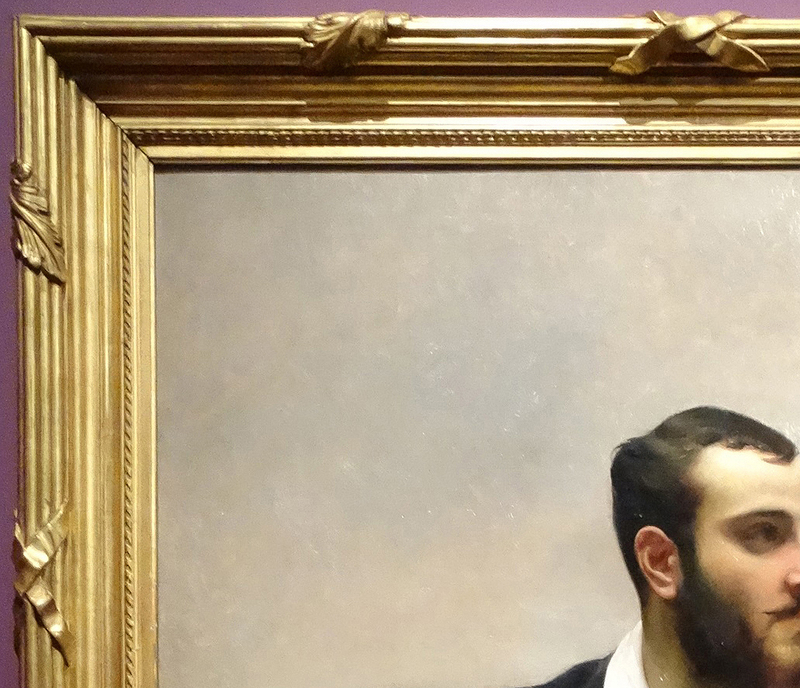 Since the painting was acquired for the state on his death in 1934, this frame was almost certainly the choice of Besnard himself – perhaps wishing to evoke and at the same time to undercut echoes of an 18th century family portrait. Later in the exhibition I found other frames similar in style to this one, finely realised yet relatively traditional. 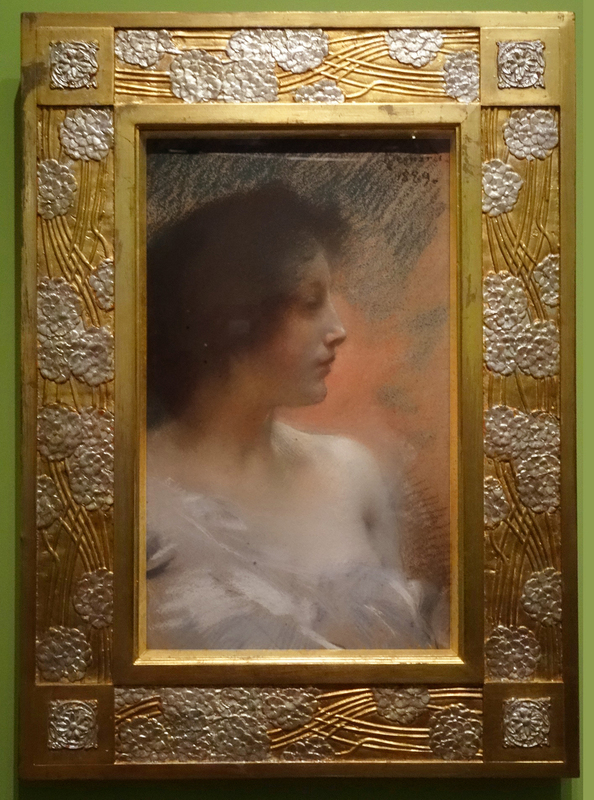 The border of Femme dans une loge is an antique carved giltwood Baroque frame; in this case, it may have been Besnard’s choice, and the figure painted to fill a frame that he had acquired. The fluid, chunky softness of the carving echoes the artist’s conception of the subject: Besnard focused on artificial light reflections, copying the technique of the Impressionist painters, as we can see from the garments and skin of the female figure. The large-scale ornament of the frame generates a luminous glow which contributes to the general effect of reflected light. Here again we see that the choice of the frame accentuates the atmosphere of the painting itself. Among the other more traditional frames, let’s pay a bit more attention to that on the Portrait de Madame Willy Blumenthal (from the pastel section, further along in the exhibition). This is another re-used antique frame – this time of the Directoire or Empire period; the sort of pattern which is often assoicated with the work of David. It may originally have been employed in portrait, rather than landscape, format. It is notable for the characteristic palmette ornament along the outer hollow, and the anthemion corners: both of which are NeoClassical revivals of a classical Greek motif. Again, this is most probably the artist’s choice: is it to make Madame Blumenthal appear more majestic, like an ancient figure of a queen or a goddess? The exhibition continued with a section dedicated to the art of the portrait. Besnard was indeed a famous and valued portraitist: ‘the favourite of literary figures, artists, and politicians of the Third Republic’. After having spent a few years in Rome, he and his wife settled in London in 1879, where they stayed for about four years. 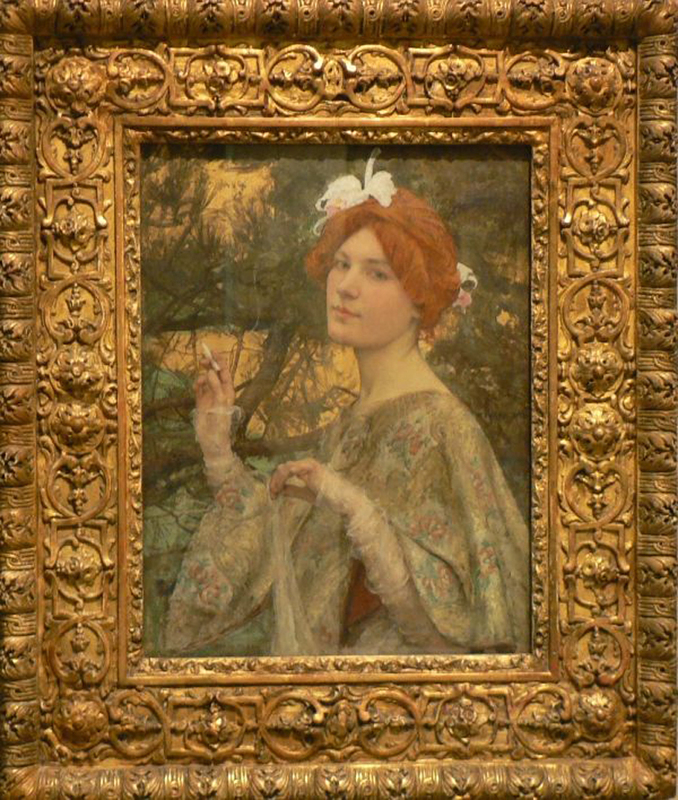 There he was influenced by the British Pre-Raphaelites, and perhaps also by their innovatory frame designs. La femme en rouge was painted during Besnard’s sojourn in London, and is said to have been influenced by the decorative paintings of women by D.G. Rossetti and Burne-Jones. 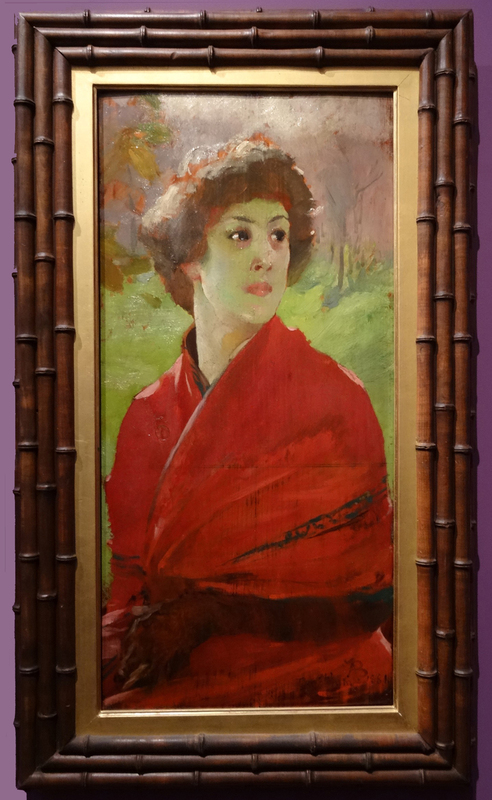 The longer I stared at this portrait, Symbolist in tone and very stylized, the more it evoked the Orient to me; – not only through its colours, mainly reds and greens, its shape – a thin vertical image much like a Japanese scroll painting or calligraphy – but also because of its unique frame, designed as a trio of bamboo stems. This cannot be anything other than the artist’s design, produced to harmonize with the painting. 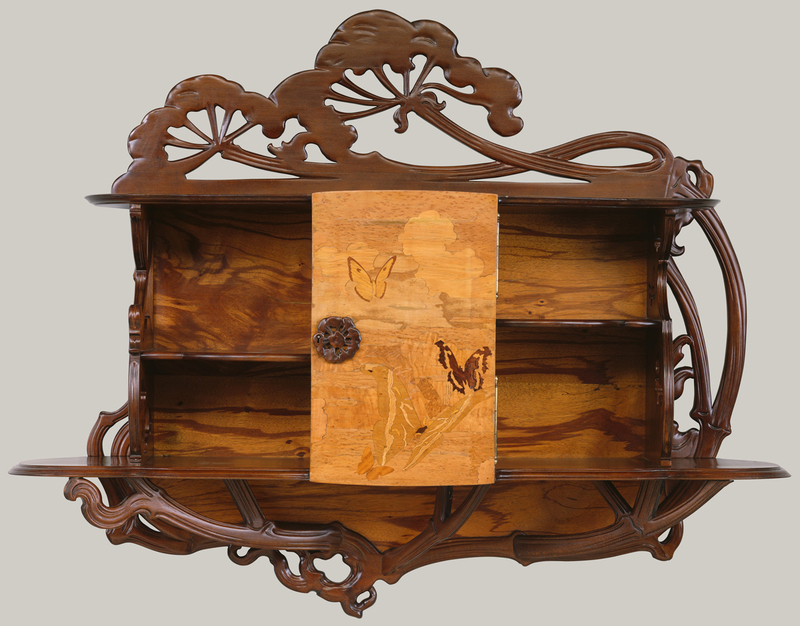 Japanese arts had begun to have a particular influence on Western culture from the mid-1850s, after trade deals restarted the import of goods from the Far East; these were collected by artists in Paris, America and London, and sparked both japonisme and japonaiserie. 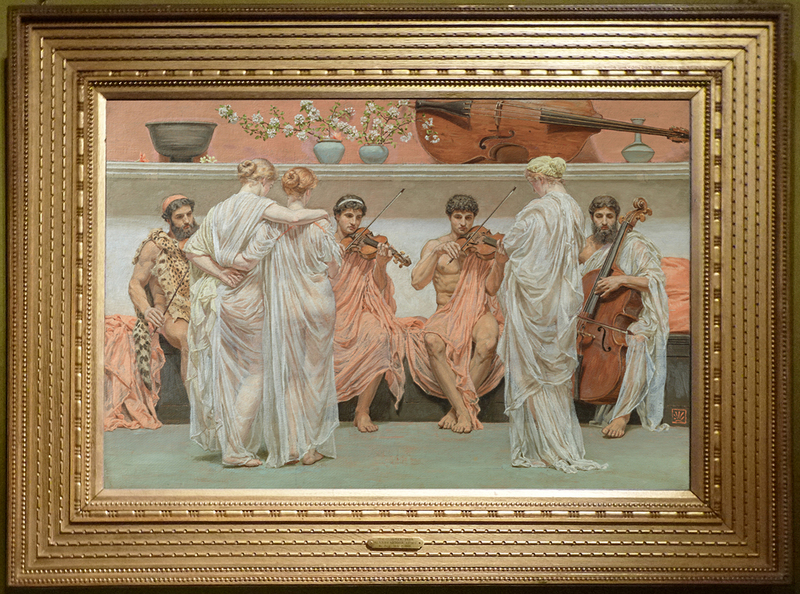 The first is a considered and digested use of elements of composition and harmonies of colour, with frames designed sparely (see, for example, the work of Albert Moore and Mortimer Menpes); the second is the undigested use of a clutter of Japanese objects in European interiors. The frame above is more japonaiserie than japoniste, but it is restrained in its effect, and enhances the subtle orientalism of the painting very effectively. This first section of the exhibition included many beautiful portraits framed in a rather sober and conventional way, like Une famille; very classical, with acanthus leaves, fasces, and linear runs of ornament. However, some frames really stood out from the crowd. 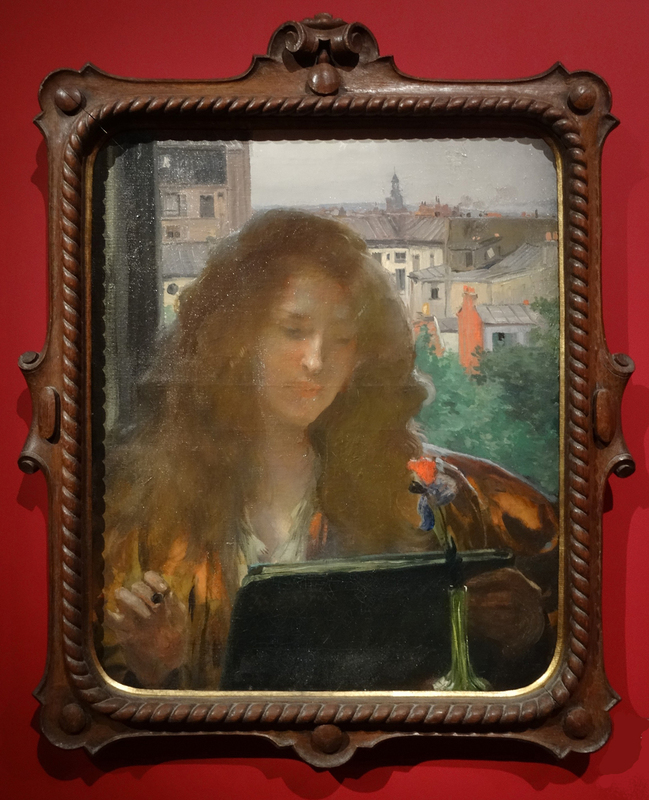 Such is the case for the portrait of Madame Rodenbach, which depicts the sitter in an Art Nouveau interior, and is framed with a wide, flat, textured wooden design. A semi-circular decorative pattern is carved in the middle of each side – a vegetal element which flares out like five petals. 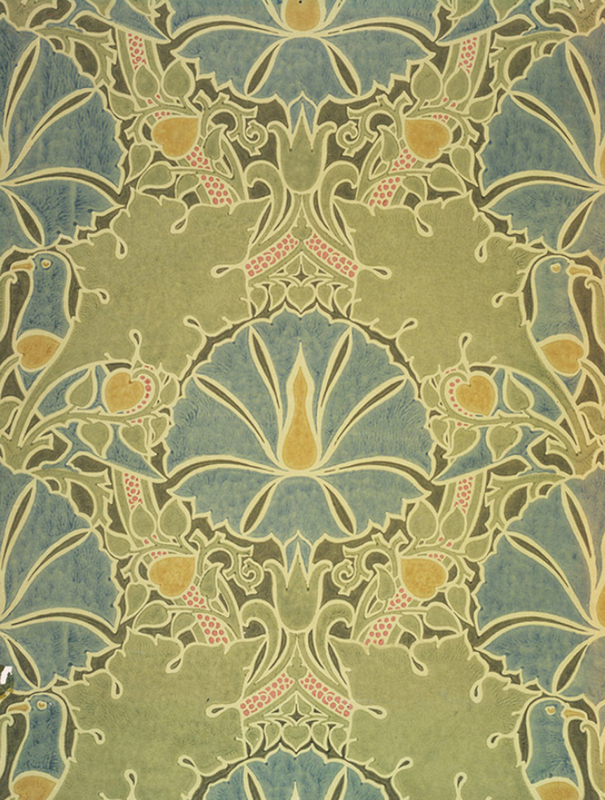 The style of these ornaments is very reminiscent of Art Nouveau motifs of the period, but showing a British influence; the motifs are in the style of repeating William Morris fabrics (or like the exactly contemporary design by Voysey, above) rather than in the asymmetric style of, for instance, Alphonse Mucha. The frame is actually very geometrical, linear and angular, and provides a wide and effective border for the painting, while the semi-circular pattern, reminiscent of a stylised corolla, echoes the halo-like arches in the background of the painting. Further on in the same room, when I was looking at the frame of the Jeune fille dessinant I couldn’t help but think of the Troubadour style. The picture was painted late in the 1870s and has nothing to do with the Gothic Revival of the early 19th century, but is characteristic of the later Renaissance revival of the mid-century . Its dark wooden structure and its decorative vocabulary/programme reminded me very much of a Renaissance piece of furniture. The inner cordlike border, the scrolls on both sides and on the top, and the ornamental balls, like the ones of a coat of arms (for example, that of the Medici) reinforce this impression. The effect on the painting, combined with the townscape of roofs behind the figure of the girl, is to recast her as a youth, an apprentice painter from the 16th century like a young Raphael. The second section of the exhibition presented Besnard as a decorative painter. He received a great number of both public and private commissions, in France and abroad. 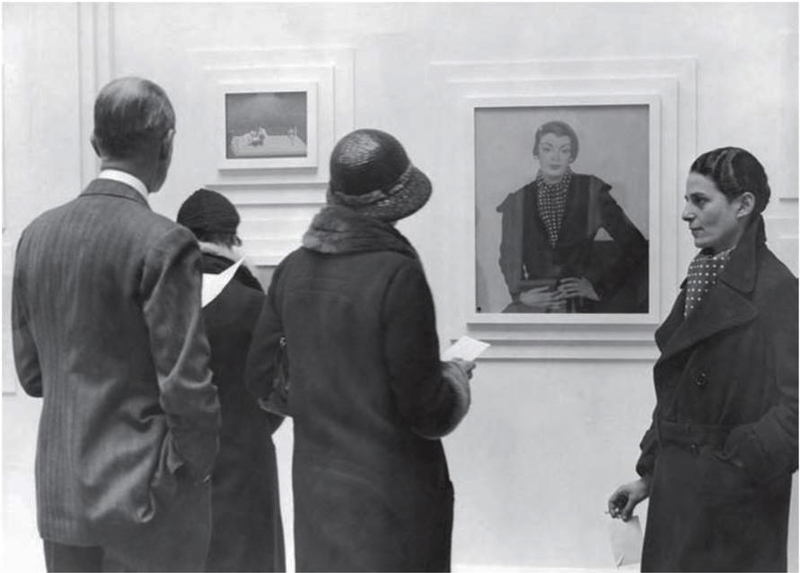 If at times he disconcerted the public and art critics with the unusual effects of his paintings, the frames from this part of the exhibition did not have the same effect. 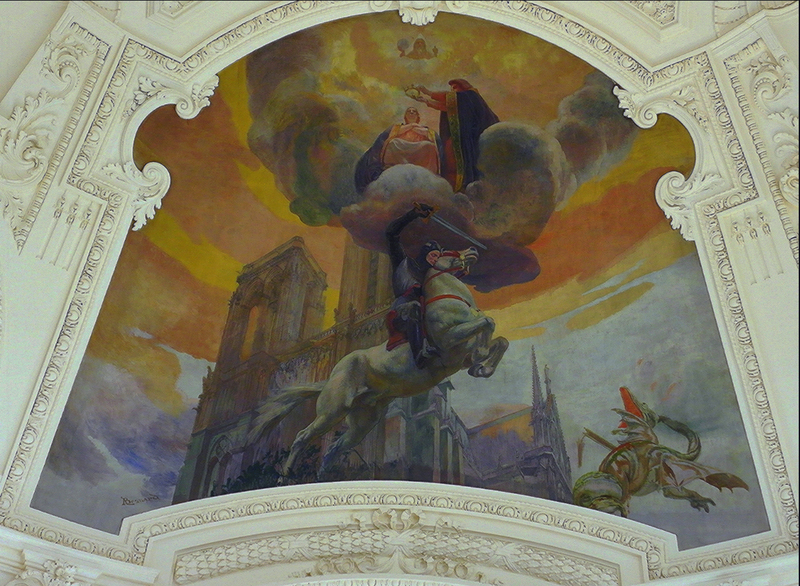 For example, the frame of the sketch for the Science Room in the Hôtel de Ville, Paris (above), a painting which caused great controversy at the 1890 Salon, is itself very classical. The outer border is a torus composed of bay leaves and berries, with hollow and small frieze at the sight edge. Once again, I was facing a finely-made and very rich but conventional style of frame; this may be related to the architectural destination of the finished mural. The next room however, housing artworks related to ‘Woman‘, also held some far more striking frames. 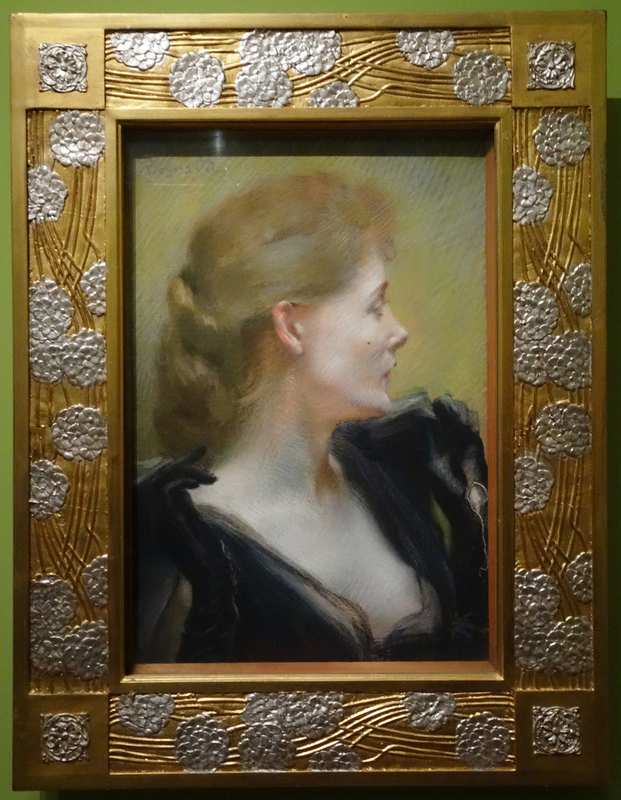 I noted two in particular – both pastels, one entitled Brune de profil of 1889 and the second, Portrait de Mademoiselle Vayssier, painted the following year. 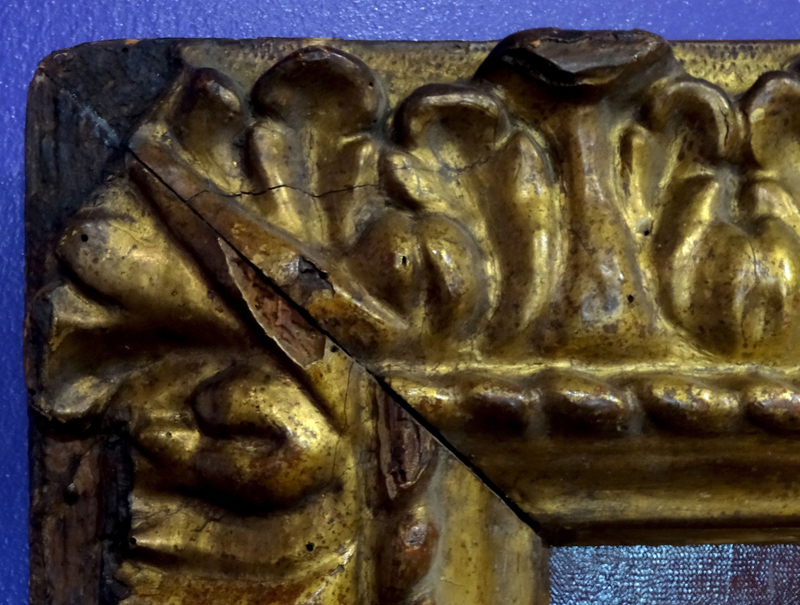 Both frames have exactly the same architrave profile, and a wide golden frieze, sunk between two fillets, and scattered with silver hydrangea-like flowers. All four corners hold cassettes decorated with silver floral patera. 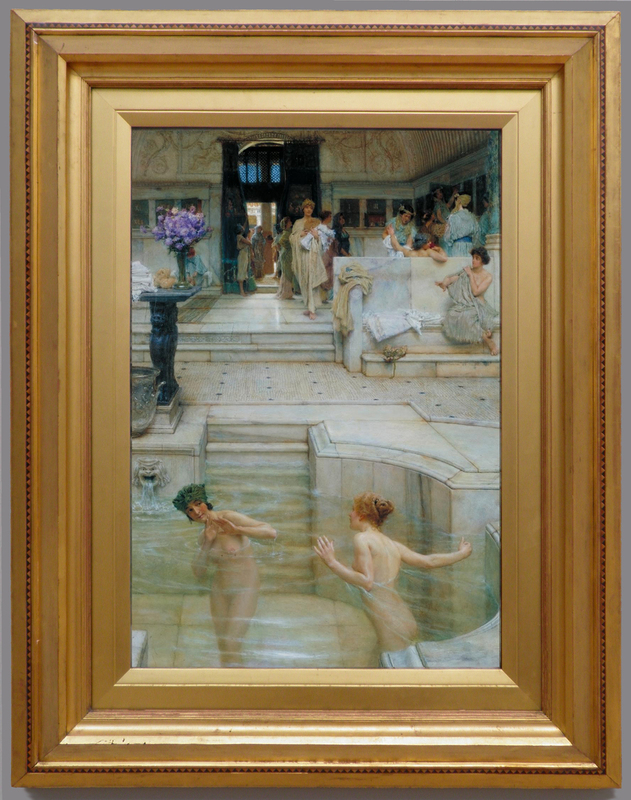 These two frames are in full Art Nouveau style; they are simple in structure and composition, yet very imaginative. Their relatively early date may put Besnard in the vanguard of designers in this style, and indicate that he was very much alive to contemporary ideas of form and pattern . Echoes of the twining branches and heads of clustered flowers decorating these particular patterns can be seen in, for instance, designs by Alphonse Mucha and Emile Gallé which use the same elements. 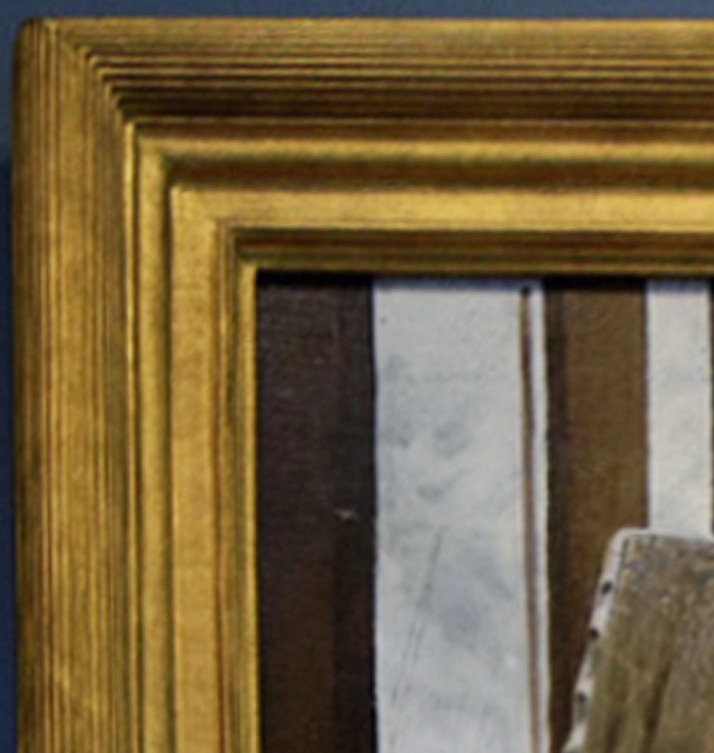 Both, however date from a decade later than the frames on Besnard’s work. 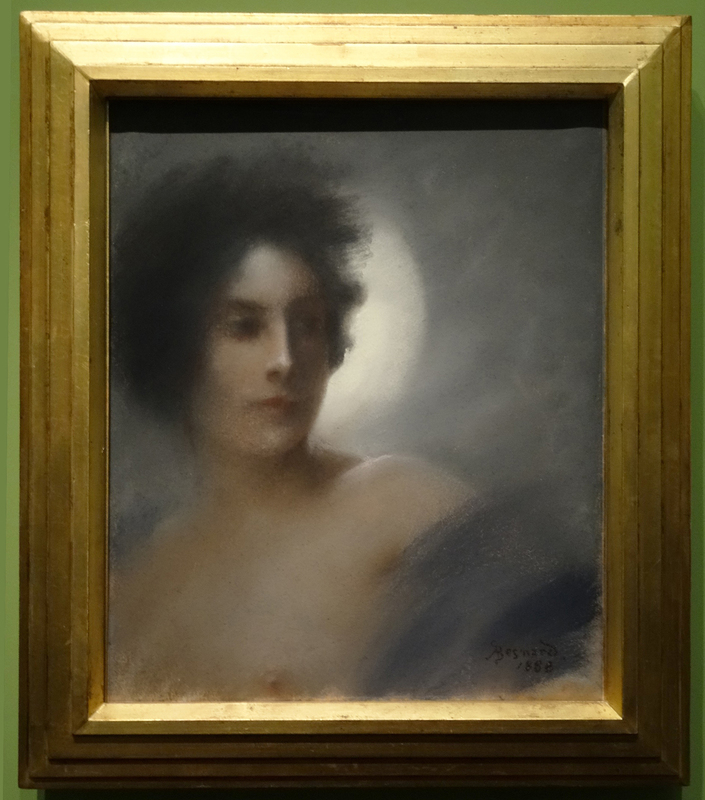 Hung in between these two pastels was a third, entitled L’éclipse or La femme au croissant de lune, in a deeply canted and stepped frame which struck me with its modernity. Here is a design which seems specifically influenced by the work of the Pre-Raphaelites: by Ford Madox Brown and D.G.Rossetti in the 1860s, and by Alma-Tadema in the early 1880s. It is almost a precursor for Art Deco and its taste for geometry, and looks forward to similar stepped and canted designs (often painted rather than gilded) used by other British artists, such as Christopher Nevinson, Gluck and Glyn Philpott in the 1930s. The exhibition ended with a last section titled ‘The freedom of elsewhere’, which sheds light on the rôle Besnard played in the contemporary fashion for orientalism. The painter travelled a lot, from Spain and Morocco to India, and exhibited more than once at the Salon of the Society of French Orientalist Painters. 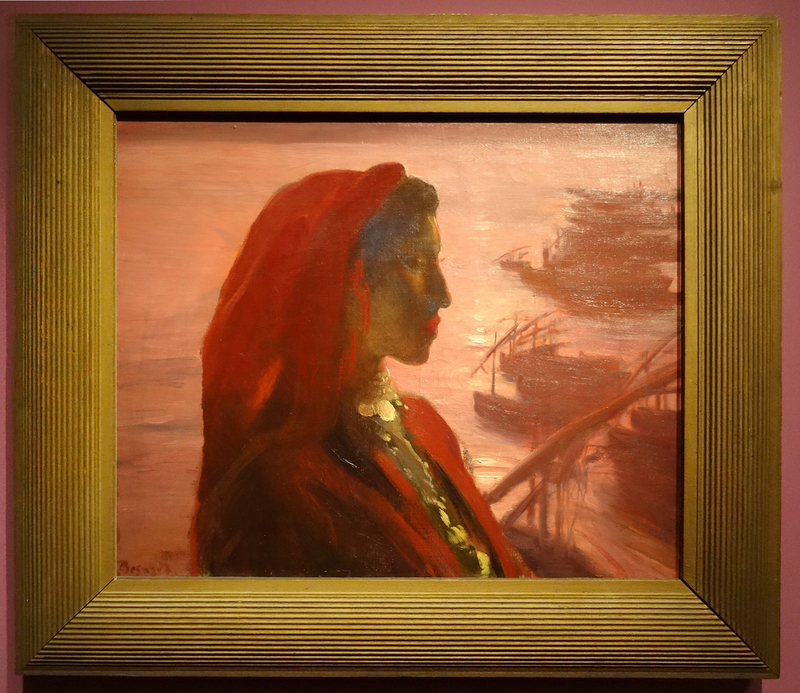 Amongst the few paintings on display there, Algerian woman depicts a majestic figure who stands out against a background representing a harbour at sunset. The frame is one of Degas’s designs: a wide convex cushion decorated with fluting, which suggests in this context an antique column, investing the sitter with an even more striking aura. It is an interesting question as to where and when this frame was acquired. Was it a dealer’s choice, applied to emphasize the impressionist qualities of the painting? Could it be an actual cast-off from one of Degas’s paintings (since not all of his clients approved of his frames, as we know from Vollard)? 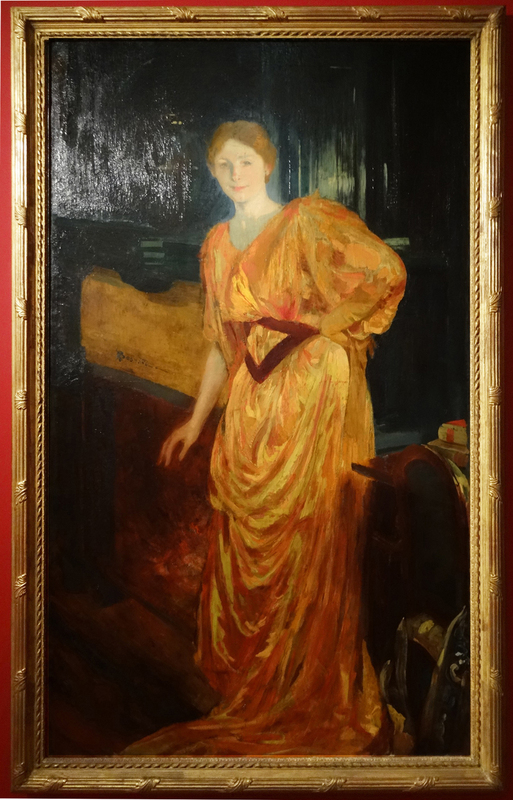 Might Besnard himself have bought it to use for a painting, as appears in two other cases, above? 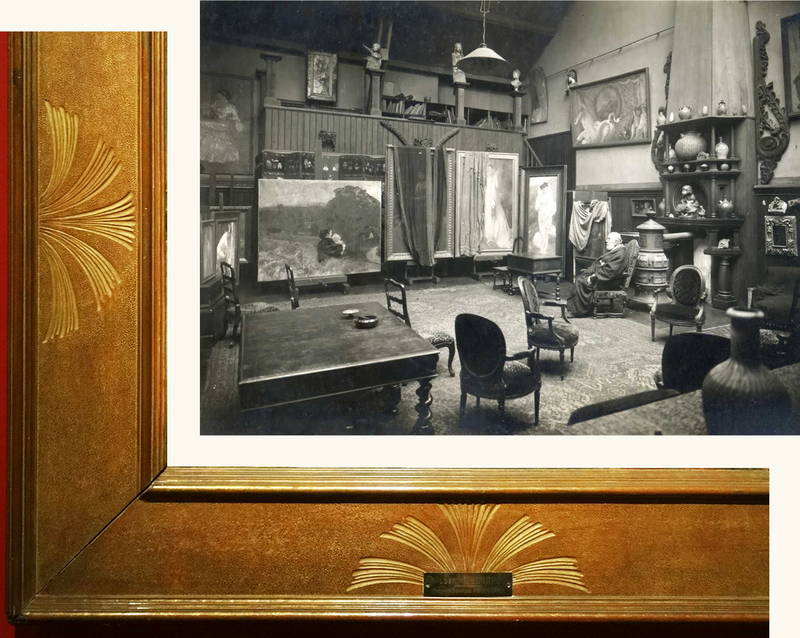 – or did he patronize Degas’s framemaker? – perhaps Pierre Cluzel , whose name is commonly mentioned in connection with Degas, or ‘Lézin (the framemaker in whom Degas place most confidence)’ . Perhaps it is a much later, lucky reframing. Aside from its artistic and historical interest, this exhibition put on display an interesting diversity of frames, something which one would like to see more often. It would definitely be interesting to delve further into the history of these frames, their conception and their evolution through time and fashion. Which are the original frames? Were some commissioned by clients, or were they mostly chosen by the artist? Do any of them reflect the sensibility of a later collector? 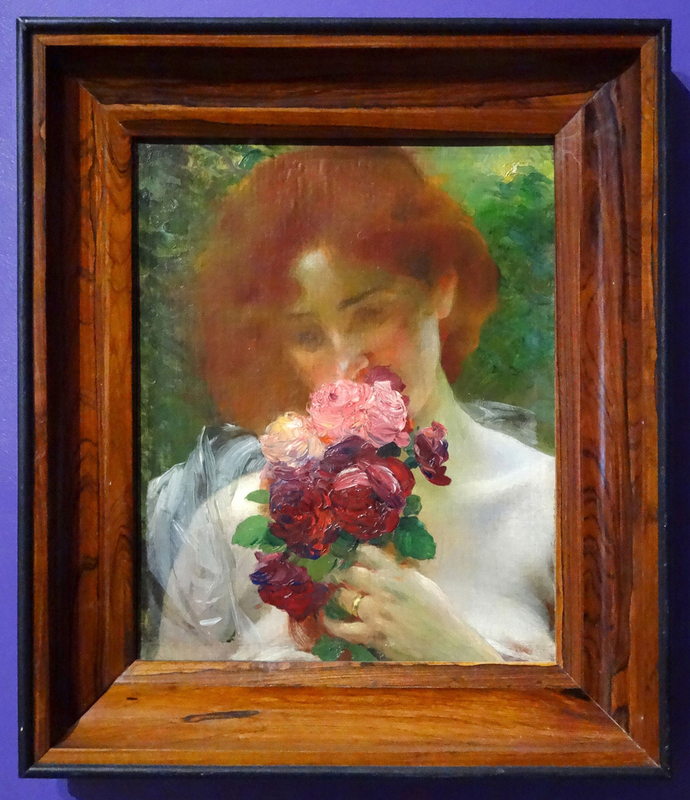 The Albert Besnard exhibition certainly sparked my curiosity in the world of frames, an aspect so often ignored by the art critic/observer. 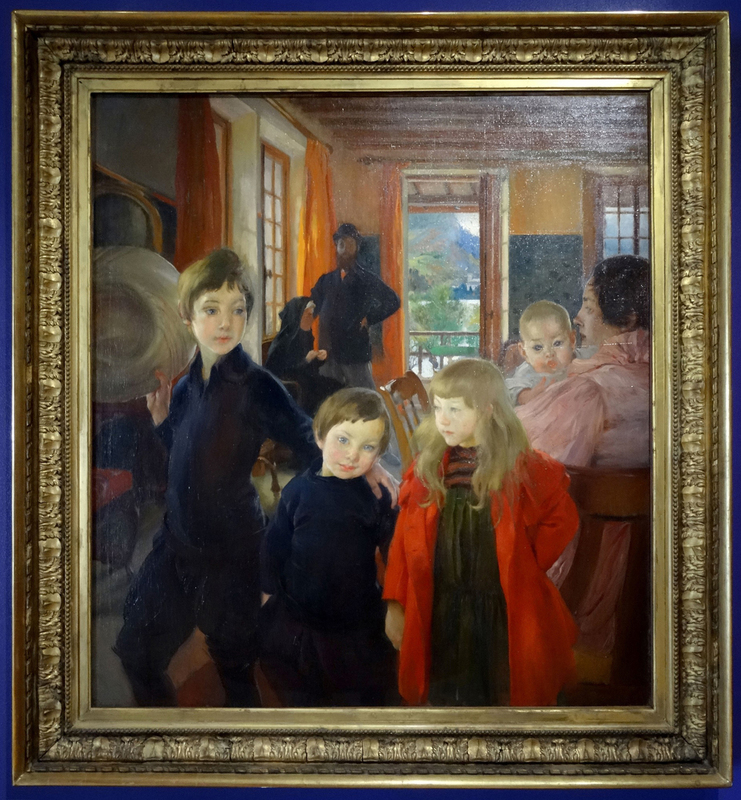 Although as yet no work seems to have been done on Albert Besnard’s frames, we do have evidence as to one frame pattern (or a small group of related patterns) for which he himself must have been responsible, either by choosing or more actively by designing it. The photograph of the artist (above) in shows him seated in front of a portrait of his wife, which is framed in a distinctive pattern of a torus decorated with a fasces moulding, bound by at intervals by a spiral leaf. 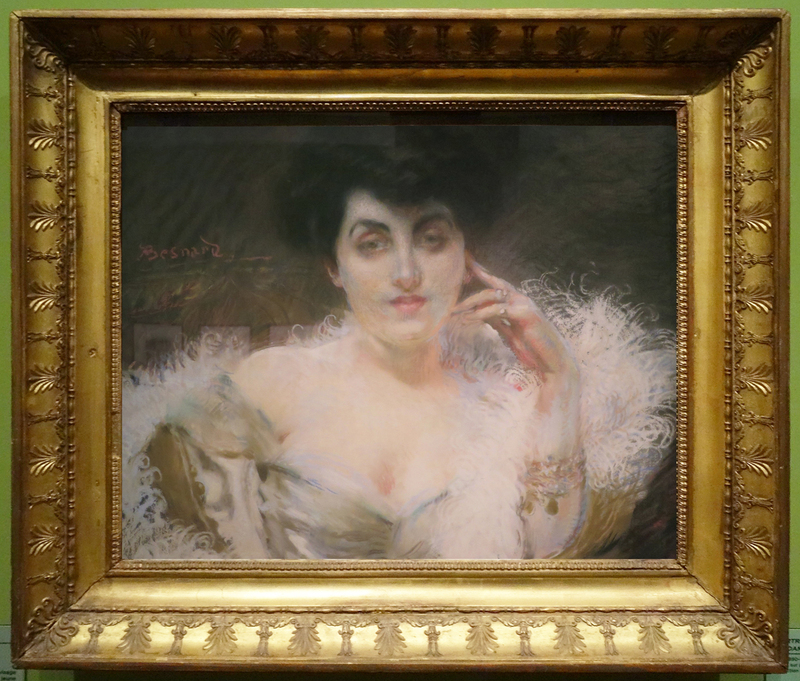 Albert Besnard, Portrait de Madame Bardet, 1893, o/c, 202 x 118 cm., Collection Lucile Audouy, Paris. Both these portraits, of the banker and composer André Wormser and of Madame Bardet, have related frames which repeat the spiral leaf-bound torus of fasces on the portrait of Madame Besnard, and extend it with inner mouldings and ornaments. 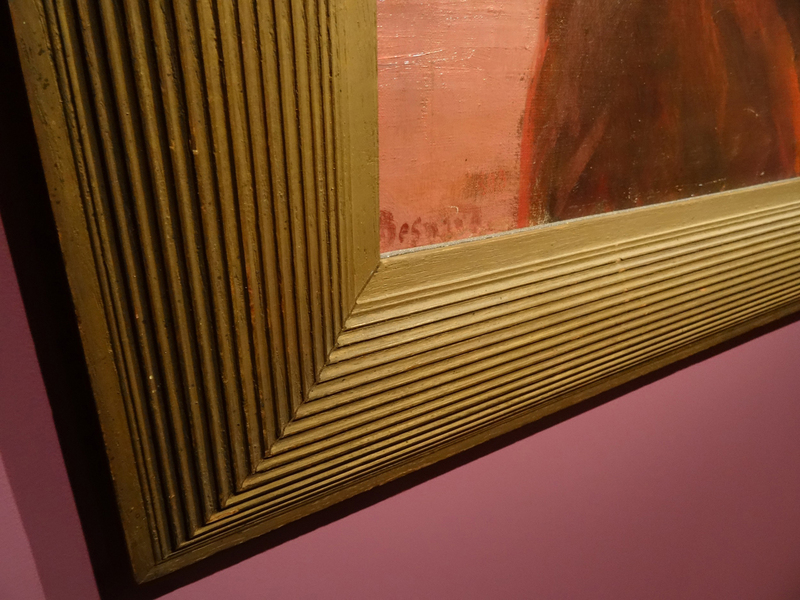 The frame of André Wormser has crossed ribbons alternating with the spiral leaf, and this combination is a reminder that Besnard travelled widely, including into Spain where he would almost certainly have visited the Prado. The Spanish Royal Collection, which forms the core of the art in the Prado, was involved in a catastrophic fire in 1734, in the Alcázar, Madrid. Many works were completely destroyed, and others were saved by being taken from their frames and thrown from the windows, the frames being left to the fire. Because of this, there was a mass reframing of the salvaged works during the 18th century in a single style of gallery frame, which was applied to paintings of various centuries and nationalities without distinction. Thus, if and when Besnard saw (for example) Veronese’s Christ & the centurion in the Prado, he would have seen it in a gallery frame made almost two centuries later than the painting – a frame composed of a convex top edge decorated with spiral leaves, a small ribbon-&-stave, and a slender torus bound with crossed ribbons. It is this design which seems to have been the model for his own portrait frames. The original Spanish model is a combination of classical, linear form (the profile, which is rather like that of a ‘Salvator Rosa’ frame, the parallel lines of moulding, the architectural ornament of fasces and ribbon-&-stave), and Rococo curvilinear lightness and organic motifs (the spiral leaves, crossed ribbons and slender rails). 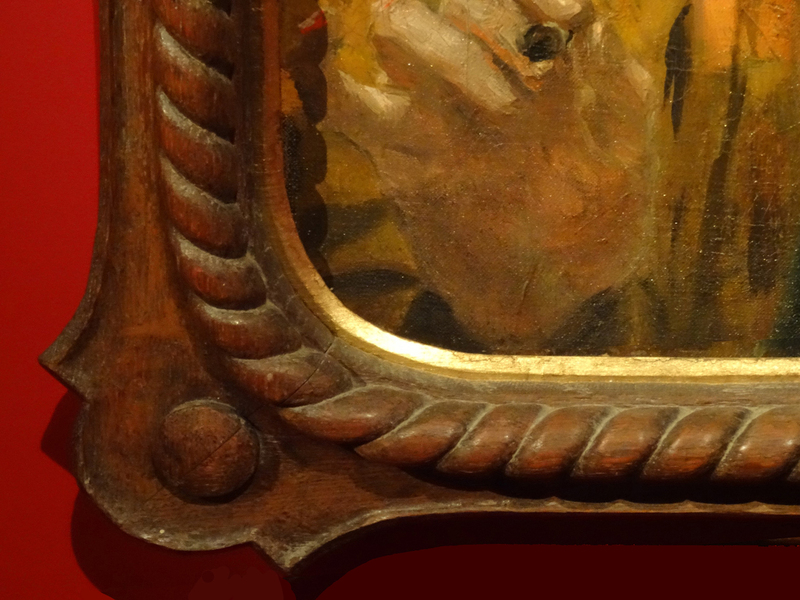 Although it looks out of place on the Titians, Veroneses, Coypels and Rubenses to which it has been applied, it converts very well to a 19th century portrait frame, providing the perfect foil for Besnard’s large sculptural forms, set in an empty, undefined space. His other frame designs are, as Arnaud de Coninck has shown, even more inventive and very varied. He had many sources to tap: he was an artist who – although he has been neglected for most of this century and for much of the 20th (since his death in 1934)  – achieved a high degree of fame and success as a portrait painter to fashionable Paris for thirty years or so from the 1880s. He travelled widely, was elected to the fifth chair in the Académie des Beaux-Arts (1912-34), and became Director of the Ecole des Beaux-Arts in 1923. He had much in common with John Singer Sargent in many respects, and, like Sargent, must have known most – if not all – of his painterly peers. When he lived for some years in London, for example, in the early 1880s, he knew both Alphonse Legros and, probably through Legros, Whistler, who, of course, had produced his own groups of frame patterns. 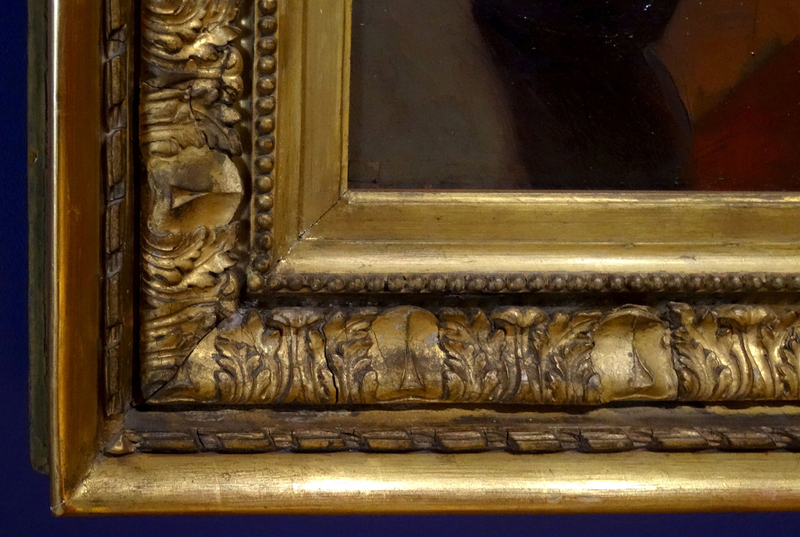 In the frame (above) on the double portrait of Mme and Mlle Lerolle, wife and daughter of the artist and collector, Henry Lerolle, Besnard (or possibly Lerolle himself) has chosen a version of a ‘Whistler’ reeded frame. 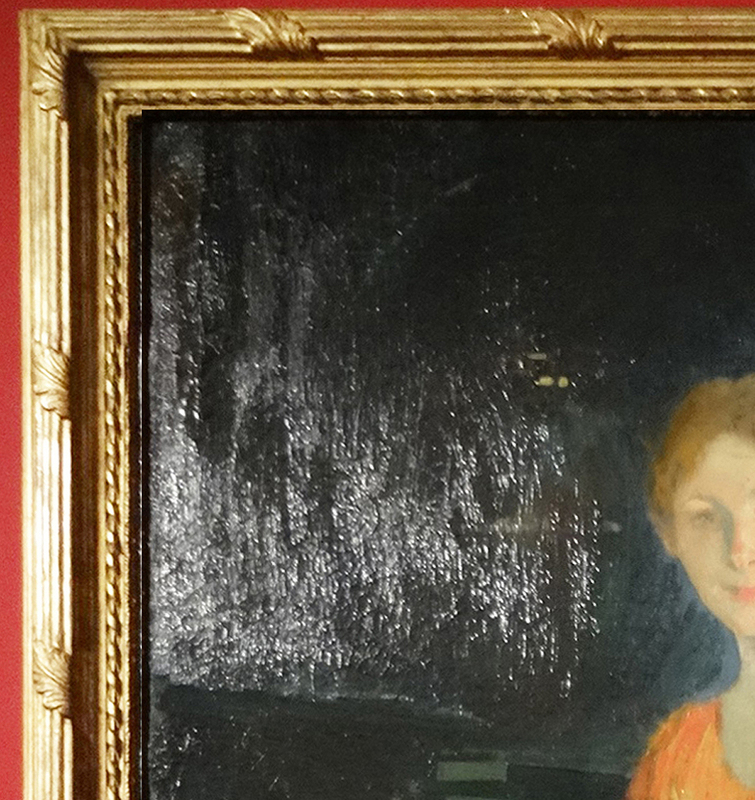 Interestingly, when the portait of Mme Lerolle and Yvonne was shown in the 1883 Paris Salon, critics compared it (to its detriment) with Whistler’s portrait of his mother, Arrangement in gray & black, no 1, also exhibited in the Salon . Whistler was using fairly shallow reeded frames with various widths of flat frieze containing either painted or engraved decoration throughout the 1870s, before progressing to a much more sculptural reeded pattern with a large convex top edge and a succession of grouped reeds and small plain friezes, which he used during the 1890s (above) . 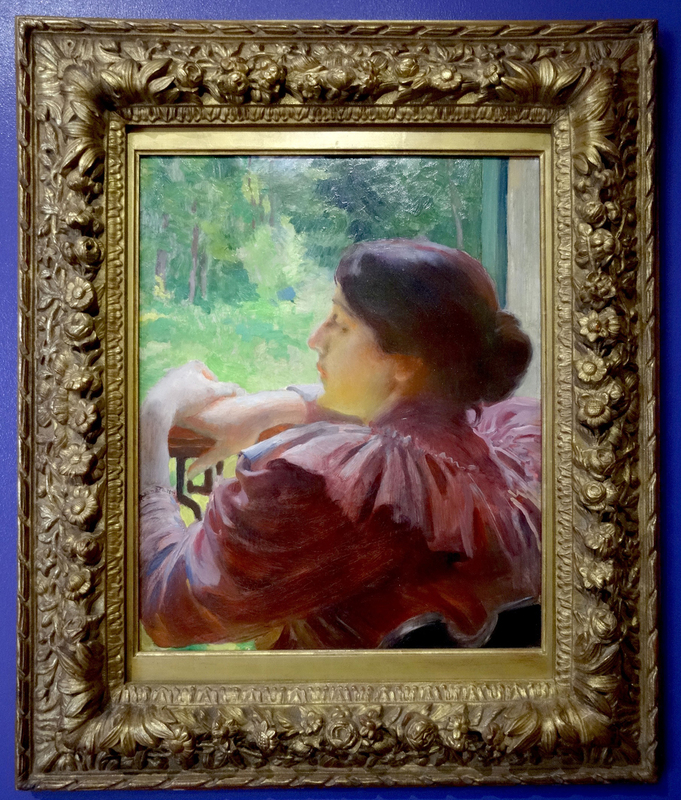 Either, therefore, this portrait was reframed in the 1890s, under the influence of Whistler’s later work, or it is a later dealer’s intervention, or it is the original frame. 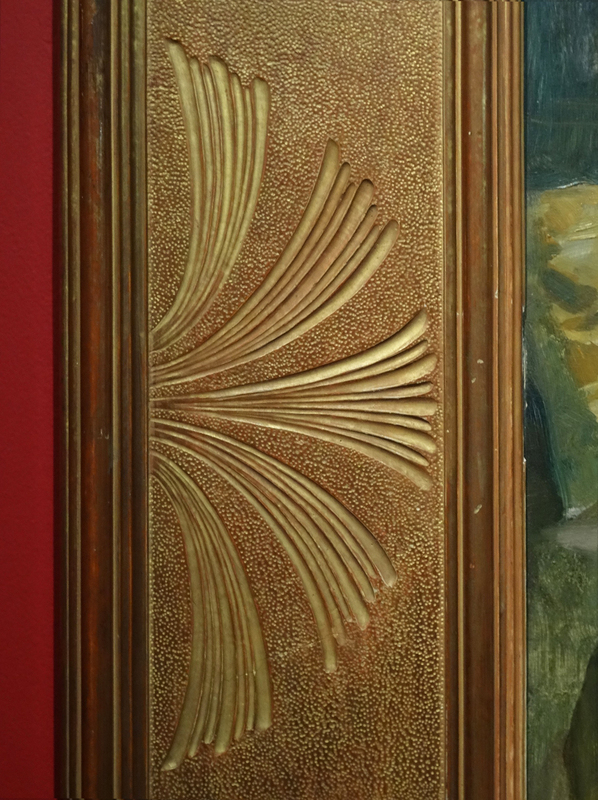 If by any chance it is the latter, it would raise interesting questions as to Besnard’s creating his own design, relating perhaps to Whistler’s earlier patterns which he would have seen in both Paris and London, and perhaps also to Degas’s reeded columnar frames of the 1880s (see L’Agérienne). It would be illuminating to survey all the existing frames on Besnard’s work, to see whether there are other examples of this type. No-one has hitherto, perhaps, considered whether Besnard, for so long so neglected as to have been thought inconsiderable in his influence, but then such a major figure amongst his contemporaries, might have been the source of, rather than the pirate of, these patterns. He did prompt Degas to comment (of Besnard’s impressionistic painting technique) that ‘Yes, yes, he flies with our own wings [but] … he is a man who tries to dance with leaden soles’ , but he had refused to exhibit with the Impressionists, and was successful with the French upper classes and establishment in a way that they might well have envied. Whistler was also famously paranoid about plagiarism, whilst fending off the idea that his own practices might not have been so original: he was anxious, for example, to quash any idea that the Impressionists might have invented the painted frame (‘I wish this to be also clearly stated in Paris that I am the inventor of all this kind of decoration of in color in the frames; that I may not have a lot of clever little Frenchmen trespassing on my ground…’ ). 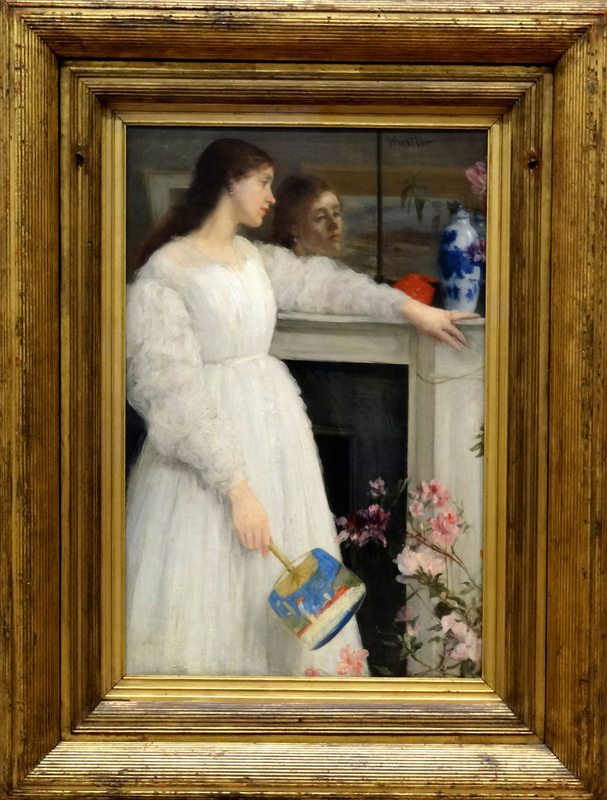 In the same way, it might not have suited Degas to have been thought indebted for his own frame designs as Whistler (in spite of his claims) was to the Pre-Raphaelites and to his mentor, Albert Moore. 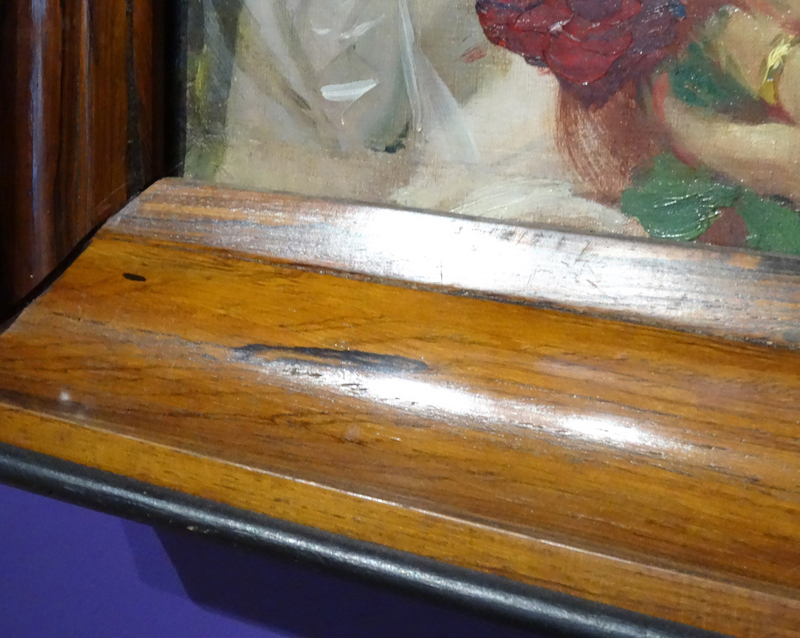 Certainly Besnard’s Art Nouveau frames seem genuinely and idiosyncratically his own invention, as do his polished wood frames, and the bamboo setting of La femme en rouge, so why – perhaps – not others? He may well have had positive influence on a later and nowadays an almost equally unknown artist: this is Edgar Maxence, who had trained at the Ecole des Beaux-Arts under Gustave Moreau, and was elected to the Académie in 1924. 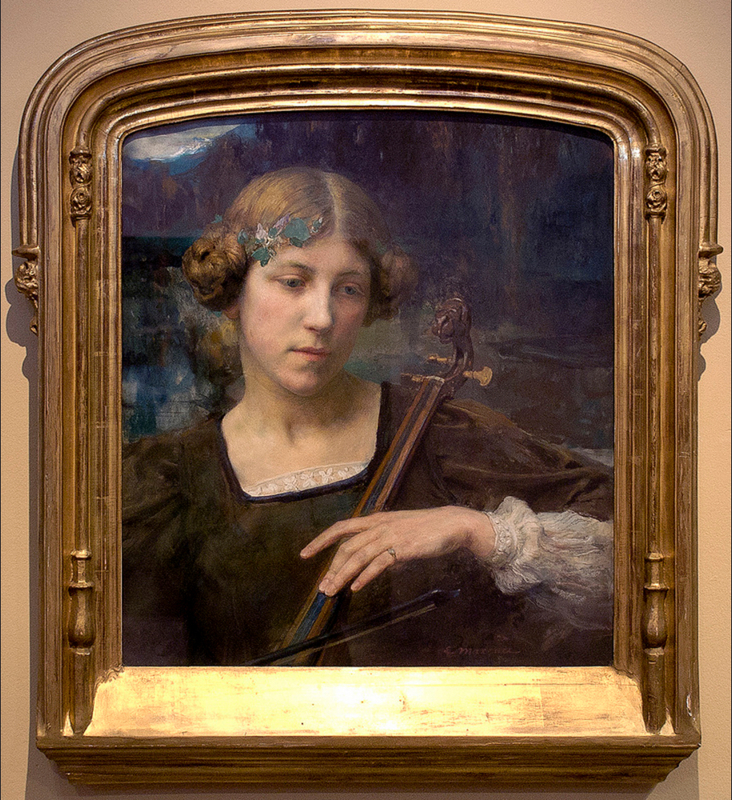 Maxence was another artist notable for the invention and variety of his own frame designs. He was twenty years younger than Besnard, and his dreamy, mediaeval figure paintings set in a shallow space seem not unconnected with those of the older artist; possibly his frames were also catalyzed by Besnard’s, since – just as with the group of stained and polished wooden frames noted above – Besnard seems to have been fractionally ahead of the field in a fertile few decades of contemporary design. 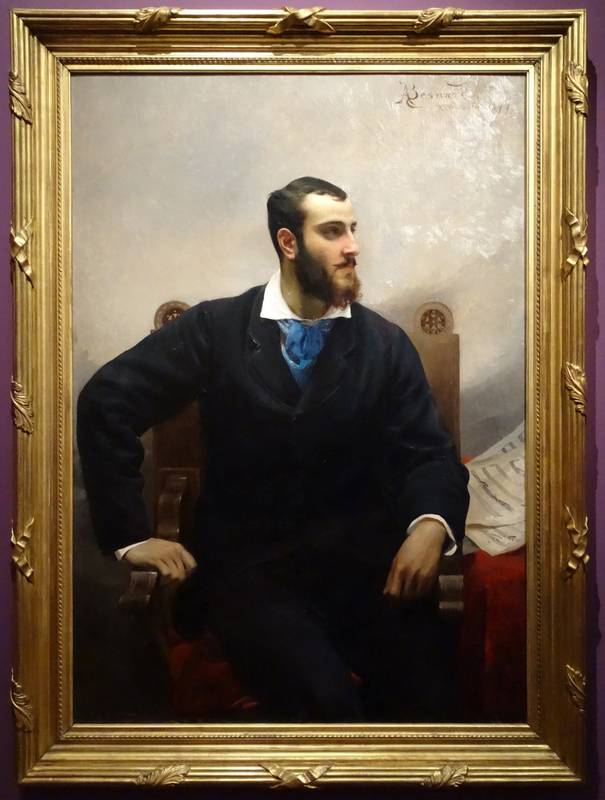 It was not his innovatory patterns which influenced (if they did) Maxence, however, but his use of historic styles (the second-hand antique frames, the 18th century Prado gallery frame, the reproduction of archaic models). Maxence’s characteristic frame type is a revival of the mediaeval rainsill frame with colonets at the sides and and optional shallow arched top, which reflects the nature of his figures at prayer, his characters from legend, and his spirits and musicians. It is similar in kind to Besnard’s use of a dark wood Renaissance-style frame for his Jeune fille dessinant, which turns her into a 16th century artist’s apprentice. As well as his own large body of work, therefore, and his reworked and original frames, perhaps Besnard may also have left ripples of influence in design spreading through the first half of the 20th century. Ralph Wornum, Keeper of the National Gallery, when reviewing the 1851 Great Exhibition in London, estimated that the most popular exhibits were in 16th century Renaissance style. 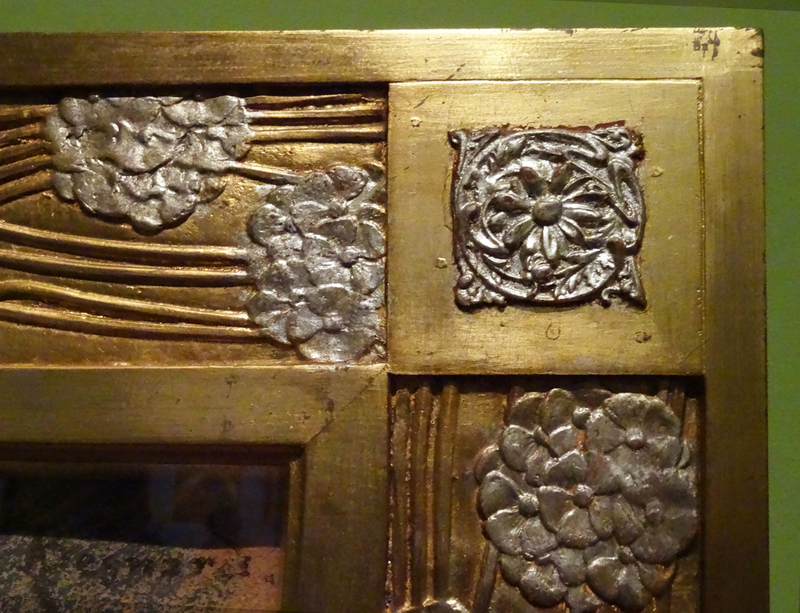 From the 1860s artists’ frames could also be found in this style. 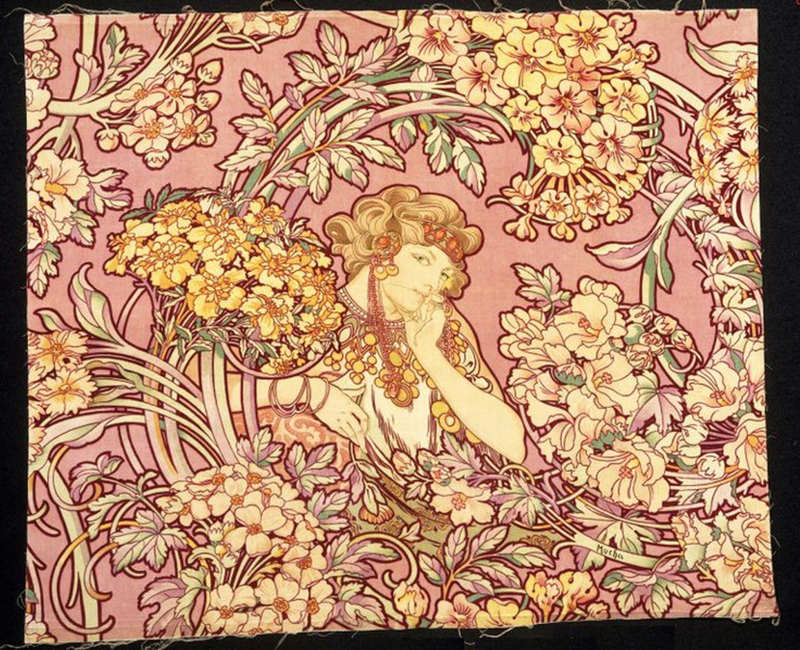 Besnard was commissioned by Samuel Bing, whose Parisian Maison de l’Art Nouveau (1895-1904) was a primary outlet for art and applied arts in this style, to decorate a ceiling for him, either in his gallery or his home. ‘A young woman with a child before an easel, by M. Bernard [sic], a rather cold painting redeemed by another [now lost] of a woman in sombre black, terrible, fateful, gaunt, by the same artist; less sombre, less fateful, less terrible, however, than this real woman posed in profile, in shadow, who is, it seems, the mother of Whistler.’ Henry Havard, ‘Le Salon de 1883’, Le Siècle, 29 May 1883; quoted in Weisberg, op. cit., p. 343, note 34. 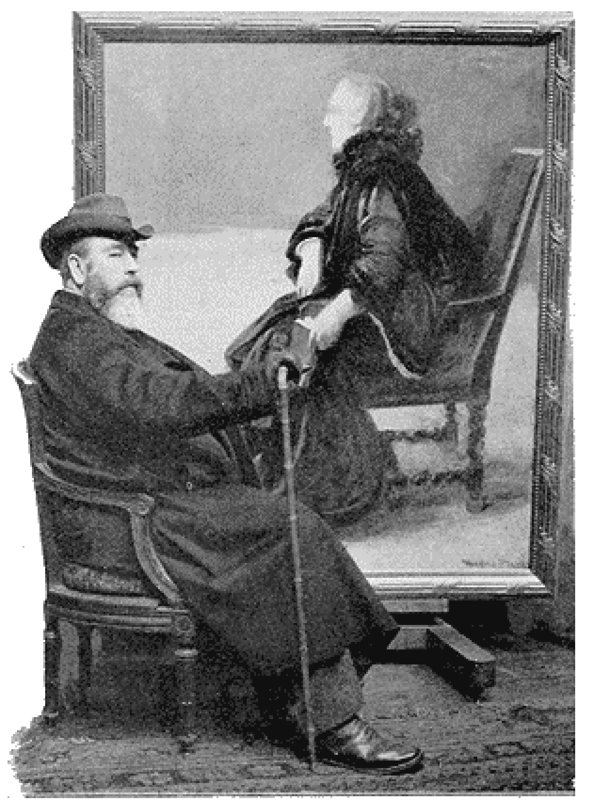 John House & Maryanne Stevens, ‘France’, Post-Impressionism: crosscurrents in European and American painting 1880–1906, 1980, National Gallery of Art, Washington, p. 57.